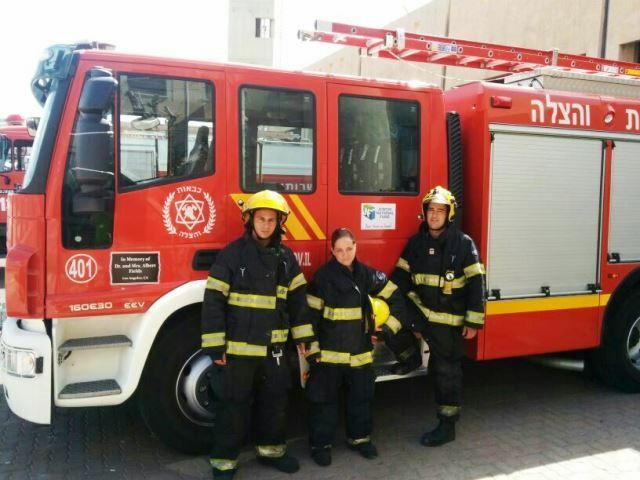 Jewish National Fund (JNF) today announced that since Operation Protective Edge went into effect on July 7, donors have purchased four new fire trucks, 30 mobile bomb shelters, and raised over$2.5 million for projects to keep Israelis safe. "The Jewish nation stands united in these trying times, while we pray for peace," said Michael Blank, JNF Boston President. "I am immensely proud of the hundreds of JNF projects helping the land and people of Israel. What we’re doing is far reaching, critically important and powerful." “I couldn't be more proud of our donors who have shown deep compassion and empathy for our extended Israeli family during this crisis,” said JNF Chief Executive Officer Russell F. Robinson. “We are responding quickly because we were already on the ground, and when this is all over we will still be there,” he added. Jewish National Fund’s emergency campaign has resulted in the purchase of 30 mobile bomb shelters for residents in the southern Israeli town of Halutza and other communities throughout the Negev Desert. Additional shelters have been ordered for residents in other area communities and JNF has received requests for more. Many residents in these new communities are living in temporary homes as they wait to build their permanent residences and as a result do not have bomb shelters in which to seek refuge. The mobile shelters being delivered hold about 10 people comfortably and cost $30,000 each. American donors also purchased four brand new Saar fire trucks for Israeli firefighters who have been working around the clock extinguishing fires caused by rockets assaults. While each truck costs more than $300,000.00, JNF donors pay $125,000.00 towards the price. The Saar, one of the most modern vehicles in the field of firefighting, can carry five persons along with assorted equipment and apparatus. Each truck weighs in at 15 tons of red fiberglass and is pulled by a 300 horsepower diesel engine. The trucks are capable of driving like a 4×4 over steep hills, rocks and ditches, and perfectly suited for the terrain of Israel’s cities and surrounding forests. “It's inspiring to see the commitment, friendship and solidarity of the community in the US and Jewish National Fund and the land of Israel. Thank you for your partnership with the fire and rescue services in saving lives” said Shiko Bar Dov, deputy commissioner of Israel’s Fire and Rescue services. Since the operation began, the Southern District’s firefighting team has switched to working in emergency mode: dispatch stations were opened in various locations in order to reduce the response time to events and firefighters from stations in the center and the north were sent to reinforce their colleagues in the south. Firefighters are summoned to all areas of missile hits and work to extinguish fire bursts following rockets falling in open areas. This is all in addition to their routine rescues. Overall, the $2.5 million raised is being used to purchase the bomb shelters, engage children in programs and activities to relieve their stress, and keep JNF’s Indoor Recreation Center in Sderot open 24 hours a day to service 1,800 children and families. The Rec Center is outfitted with bomb shelters and provides children with a safe place to play, and others the comfort of a good night’s rest. Funding has also gone to JNF’s partner Green Horizons youth leadership group, which has delivered activities for hundreds of children in bomb shelters, along with food and essentials; to extra professionals brought in to aid and care for people with severe disabilities at the Aleh Negev rehabilitative village; to JNF partner, The Society for Preservation of Israel Heritage Sites, which has given free admission at 60 sites across Israel; and to JNF partner LOTEM, that is taking people with special needs to Israel’s northern areas and away from danger zones. To donate to JNF's Emergency Campaign, visit www.jnf.org/protectiveedge or contact Director Sara Hefez at shefez@jnf.org or 617.423.0999 x811.